Malawi, a landlocked country in Southeast Africa bordered by Zambia, Tanzania, and Mozambique has a total land area of 45,747 square miles and a population of over 15 Million. Malawi is among the world's least developed countries with low life expectancy and high infant mortality. The economy is heavily based in agriculture, with tobacco being the highest contributor. The other sectors are lumber, cement and consumer goods. Following the rains it takes on a lush green whose terrain diversity includes plateaus, highlands, forests, mountains, plains, escarpments and dramatic river valleys. Their culture is a fusion of both its native and colonial history and is easily noticed in their dance, art and music. The best time to visit Malawi is from May through November. 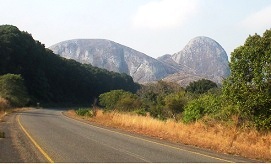 Lake Malawi National Park and the Chongoni Rock Art Area are its two World Heritage Sites. The warmth of its people, and wildlife viewing and outdoor activities in dramatic setting are the major draw. Nsima (maize porridge) is the main dish and sides of beans, vegetable or fish rounds up a meal. Malawi Bradt Travel Guide 978-1841623139 $18 Part 1 is an excellent travelers introduction. Part II through V features region-wise coverage on Lilongwe and South-Central Malawi, Southern Malawi, North-Central Malawi, and Northern Malawi. Malawi Map by ITMB 978-1553413073 $11 1:900,000 Scale. The first stamps of Malawi were a set of four stamps released on July 6, 1964 to mark the day when the country became independent. The set (Scott #1 to #4) is inexpensive and catalogs for around a dollar MNH or used. It featured Dr. H. Kamuzu Banda, the Prime Minister along with the following: Independence Monument, Sun Rising from Lake, National Flag, and Coat of Arms. This was followed by a set of thirteen stamps released on the same date showing local scenes. That set (Scott #5 to #17) is more valuable and catalogs for around $12. The designs show mother and child, chambo fish, zebu bull, peanuts, fisherman in boat, harvesting tea, tung nut, flower and leaves, lumber and tropical pine branch, tobacco drying and Turkish tobacco plant, cotton industry, Monkey Bay at Lake Nyasa, afzelia tree, and nyala antelope. The area of Malawi was the British Protectorate of Nyasaland from 1891 to 1964. A set of fourteen stamps released on November 13, 1968 in the Birds theme. The set (Scott #95 to #109) catalogs for around $75 MNH and around $90 used. The designs show scarlet-chested sunbird, violet-backed starling, white-browed robin-chat, red-billed firefinch, Nyasa lovebird, yellow bishop, southern carmine bee-eater, grayheaded bush shrike, paradise whydah, African paradise flycatcher, bateleur, saddlebill, purple heron, and Livingstone’s lorie. A set of four stamps and a souvenir sheet of the four stamps released on June 1, 1978 showing Animals and the Wildlife Fund Emblem. The set (Scott #319 to #322 and #322a) is sought after and catalogs for around $140 MNH and around $55 used. The designs show lions, nyala, Burchell’s zebras, and reed-buck. A set of six stamps released on March 21, 1994 in the Fish of Lake Malawi theme. The set (Scott #628 to #633) catalogs for around $10 MNH or used. The designs show powder blue cichlid, auratus cichlid, kennyi cichlid, red-finned cichlid, zebra cichlid, and slender mbuna. Lake Malawi hosts more species of fish than any other body of water on Earth. Cichlids are a popular aquarium fish due to their bright colors. A strip of four stamps and a souvenir sheet released on November 10, 2003 showing Puku Antelopes. The set (Scott #714a-d and #714e) catalogs for around $10 MNH or used. The first coin of Malawi was a Republican Sterling Coinage (12 Pence = 1 Shilling, 2 Shillings = 1 Florin, 5 Shillings = 1 Crown, 20 Shillings = 1 Pound) Copper-Nickel-Zinc 6 Pence coin issued in 1964 showing a head portrait in Obverse and Rooster in Reverse. The issue has very high mintage (~15M) and catalogs for a few dollars in UNC. Decimal Coinage (100 Tambala = 1 Kwacha) Debut in 1971 with the introduction of Bronze Tambalas in 1971. That issue also has very high mintage (15M) and catalogs for less than a dollar in UNC. Commemorative Gold Coins Debut in 1975 with the release of the 10th Anniversary of the Reserve Bank issue showing Head Portrait in Obverse and Eagle with wings spread above lined design and value in Reverse. Malawi’s Gold coins catalog well above bullion value. Coins $2 and up Common UNC Tambalas start around $2. Commemorative Republic Issues of 1996, Endangered Wildlife Proofs, etc start around $10. UNC Kwacha Commemorative Proofs starts around $25. Silver Proofs from the 1970s onward starts around $50. Color Silver-Gilt Animal Sets, Silver Animal Proofs, Gold Silver Hologram Coin Sets, etc go into the 100s. Paper Money $2 and up Common UNCs from the 2000s starts around $2. Consecutive UNC lots of 5-pieces or more starts around $10. Year Sets, Bundles etc start around $35. High Value Bundles and Rare Specimens start around $100. Basket weaving, mask carving, and painting skills of Malawians are highly acclaimed and items in this vein are sought-after by tourists. Miscellaneous Collectibles $3 and up Patches, flags etc start around $3. Aegirine Crystal samples start around $15. Original signed Malawi Folk Art Oil Paintings start around $25. Larger and unusual crystal samples start in the 100s.